If you are among the many drivers of Indiana that want to want to find a wide selection of used cars for sale near me at used car dealerships in Terre Haute, then stop on over to the used car dealerships in Terre Haute, IN of Terre Haute Auto. At Terre Haute Auto, drivers just like you can easily find a wide range of used cars for sale near me at used car dealerships in Terre Haute. From cheap used cars for sale near me all the way to used cars for sale in Indiana that are loaded with options, Terre Haute Auto can easily help you get back out on the open road with a vehicle that you will love at our used car dealerships in Terre Haute, IN. The used car dealerships in Terre Haute of Terre Haute Auto have a knowledgeable staff is ready to answer any questions you have and steer you in the right direction when choosing your next car. So come and make a stop to Terre Haute Auto used car dealerships in Terre Haute IN today, and drive home with a used car for sale that you can be proud to drive around! That includes a large selection of used SUVs for sale at Terre Haute Auto. This used car dealer near me has a large selection of used SUVs for sale near me. If a used SUV is what interests you, check out one of the used Jeeps for sale. Like the used Jeep Wrangler Unlimited Rubicon. This used SUV for sale at your local Terre Haute used car dealer comes with many features both inside and out that you will not want to miss. This used SUV for sale comes with a leather-wrapped steering wheel, convertible soft top, and a premium sound system. This used Jeep for sale also comes with an adjustable steering wheel controls, comfortable cloth seats, and air conditioning. This used SUV for sale also comes with an auxiliary audio input, which makes the stereo system MP3 compatible. Now you can listen to all of your favorite music while cruising the streets of Terre Haute in your next SUV from Terre Haute Auto. This used SUV for sale also comes with many impressive safety features that you will not want to miss. Like anti-lock brakes, electronic stability control, and a rollover protection system. Other can’t miss features included with this used SUV for sale near me are, a tire pressure monitoring system, power steering, and multiple airbags. 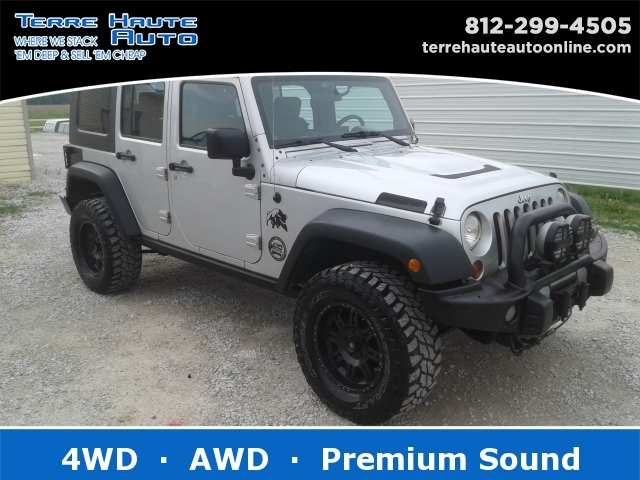 The used Jeep Wrangler Unlimited for sale is ready to take on all of your driving needs here in Terre Haute, Indiana. Whether that be going to and from work every day, running errands around town or taking the day off and heading out for a weekend getaway. Come to used car dealerships near me of Terre Haute Auto and see this used Jeep Wrangler Unlimited for sale. While you are there take this used SUV for sale on a test drive down the streets of Terre Haute, IN. When you are looking for used car dealers near me, come to the auto dealers near me of Terre Haute Auto serving Terre Haute and the surrounding Indiana areas. When it comes to buying your SUV, the options can be confusing. To help you make an informed decision, we are happy to go over your options. From used SUVs for sale to financing your SUV, we are here for all of your SUV needs at the Terre Haute Auto. Call today to schedule an appointment for a test drive at 812-299-4505. You can find Terre Haute Auto located conveniently at 13350 S US Hwy 41, Terre Haute, IN 47802.